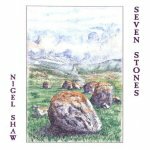 Having loved the beautiful haunting melodies of The Lone Tree, Karen was excited to add Seven Stones to her collection as a similar but distinct collection of tracks, which she now loves just as much. This has become a firm favourite in her meditation classes, being at times peaceful and restful and at others immensely powerful and moving. This is a beautiful and dynamic recording reflecting aspects of the sacred landscape both without and within. The seven movements, (Gateway, Birth, Hearth, Broken, Altar, Dreaming and Sanctus), are each a key for entry into the circle of life and each represents a foundation stone of our nature. The music features richly interwoven melodies and rhythms created on Native American cedar flutes alongside the harp, ocarina and cimbala as well as synthesisers, drums, percussion and voices. It is a journey of sound and movement inspired by and created on Dartmoor, an area filled with the power and beauty of nature. Total album duration: 51 minutes.